A Blog about Latest News In Internet & Mobile Technologies. Have you ever seen a paralyzed person working by his own?, If no, then you are going to see it very soon.Yes… it has been made possible by scientists in a clinical research. They made it possible to command a robotic arm with the thought of the user. This trial was conducted by the collaborative effort of the Department of Veterans Affairs, Brown University, Massachusetts General Hospital, Harvard Medical School, and the German Aerospace Center, using an investigational device named as BrainGate neural interface system. The device uses BCI(Brain Computer Interface)system, which enables the control of the robots using brain commands. According to a report published in Nature.com, two persons who are paralyzed with the stroke, were able to control the robotic arm to reach and grasp the water bottle. 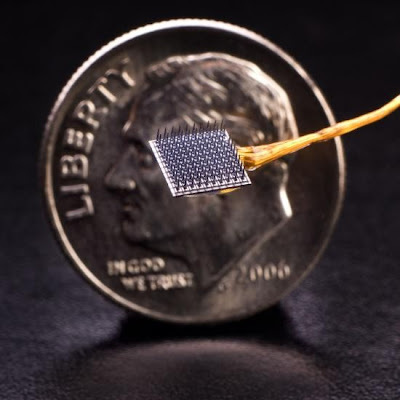 For the trial of the brain gate system a very tiny sensor(which is a silicon microelectrode array) with 96 tiny hair-like appendages was implanted in the brain to capture the signals of underlying intentional movement. It was the first time when the woman took the trial, and the trial was quite successful. After the trial lead investigator and critical care neurologist at Massachusetts General Hospital, Leigh Hochberg said,"The smile on her face was a remarkable thing to see. For all of us involved, we were encouraged that the research is making the kind of progress that we had all hoped"
The trial was conducted on two individuals to compare them, one was named as S3(58 year old woman shown in Pic.) and the other one was an 66 year old man recognized as T2. According to the report test was successful and the conclusions show that the system is not as fast as it should be and the machine was able to response faster for able-bodied persons as compared to paraplegics. For sure, BrainGate is a life changing technology and a revolutionary device that gives renewed hope to quadriplegics, paraplegics, and other people who are suffering from spinal cord injuries and strokes, Amyotrophic lateral sclerosis etc. Moreover, it has all the potential to revolutionize the way all of our brains work and react. The persons who want to be a part of the trail can apply for the recruitment of the cadidates, Stanford University and Massachusetts General Hospital are actively recruiting participants for their clinical trials. Hoping to see it very soon as a part of their life.